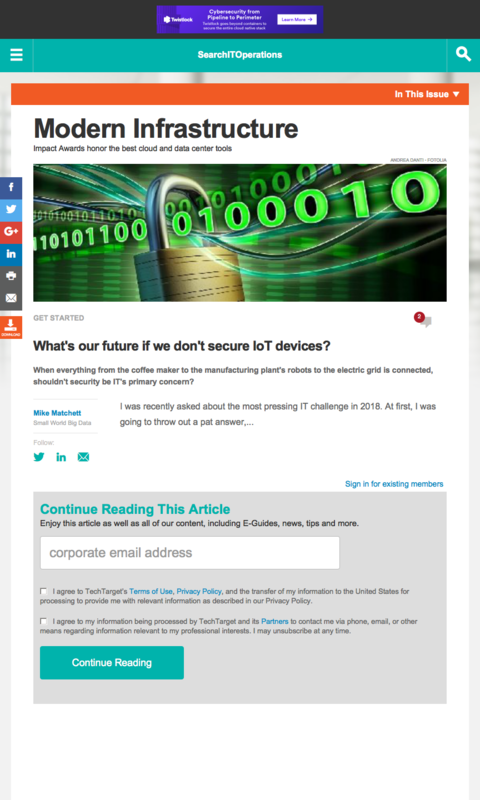 What’s our future if we don’t secure IoT devices? An IT industry analyst article published by SearchITOperations. When everything from the coffee maker to the manufacturing plant’s robots to the electric grid is connected, shouldn’t security be IT’s primary concern? I was recently asked about the most pressing IT challenge in 2018. At first, I was going to throw out a pat answer, something like dealing with big data or finally deploying hybrid cloud architecture. But those aren’t actually all that difficult to pull off anymore. We should be much more afraid of today’s human ignorance than tomorrow’s AI. Then I thought about how some people like to be irrationally scared about the future, and bogeyman like artificial intelligence in particular. But AI really isn’t the scary part. It’s the blind trust we already tend to put into black-box algorithms and short-sighted local optimizations that inevitably bring about unintended consequences. We should be much more afraid of today’s human ignorance than tomorrow’s AI. Instead, what I came up with as the hard, impending problem for IT is how to adequately secure the fast-expanding internet of things. To be clear, I interpret IoT rather broadly to include existing mobile devices — e.g., smartphones that can measure us constantly with multiple sensors and GPS — connected consumer gadgets and household items, and the burgeoning realm of industrial IoT. The rush to secure IoT devices isn’t just about your personal things, as in the risk of someone hacking your future driverless car. The potential scope of an IoT security compromise is, by definition, huge. Imagine every car on the road hacked — at the same time. IoT exploits could also go wide and deep. Sophisticated compromises could attack your car, your phone, your home security system, your pacemaker and your coffeepot simultaneously. Imagine every coffee machine out of service on the same morning. We haven’t even begun to outline the potential nightmare scenarios caused by insecure IoT devices. And I sure hope Starbucks is keeping some analog percolators on standby. If personal physical danger isn’t scary enough, think about the ease with which a single penetration of a key connected system could cause a nationwide or even global disaster. For example, a 2003 cascading power outage that affected over 50 million people in New England was triggered by a single alarm system misconfiguration. An inability to recover or reset something easily at that scale could push one into imagining a truly dystopian future. What worries me more than the possibility of a large, direct attack is the very real likelihood of slow, insidious, creeping subversion, achieved through IoT device security breaches. And not just by one party or a single bad actor, but by many competing interests and organizations over time — some with supposedly good intentions. We will make mistakes, take shortcuts and ignore vulnerabilities until it’s too late. 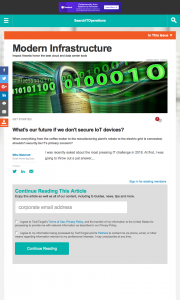 This entry was posted in IT Analyst, Published Articles and tagged IoT, SearchITOperations, Security by Mike. Bookmark the permalink.